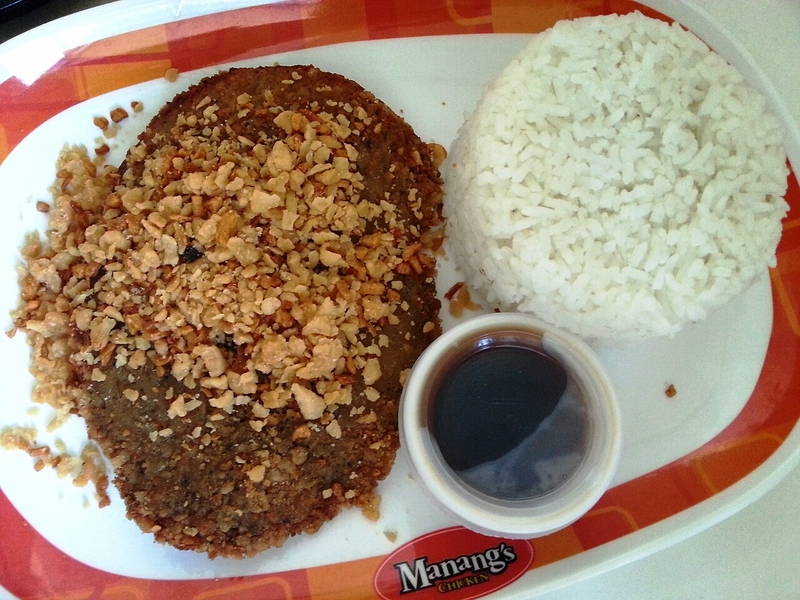 I've known Manang's Chicken for its tasty double deep fried crispy chicken with soy garlic sauce. 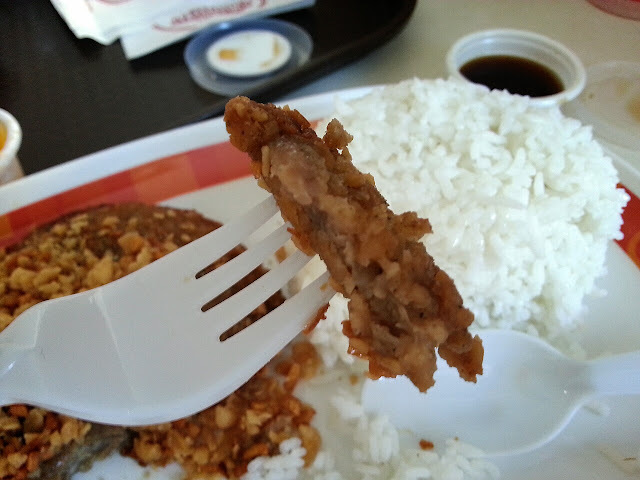 But just a couple of days ago, I went to Glorietta and saw that they now have what they call as the Garlic Pork Fillet Meal. And so I decided to try it. Since I didn't have heavy breakfast before working out at the gym, I was famished by lunch time. As such, I order A LOT! Let's start it off with appetizers. 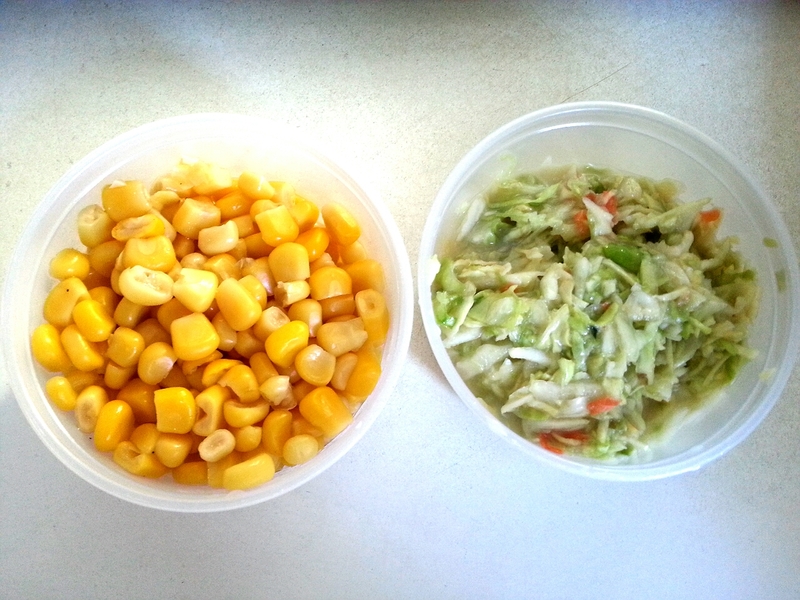 Manang's Chicken actually has three sides - Macaroni Salad, Coleslaw, and Buttered Corn. I got the latter two since I love corn to bits and I want some veggies for my meal. Their corn was really fresh, but the coleslaw needs improvement. Both were okay, nothing fantastic, but I wish I ordered more corn, corn, corn! The small cup costs Php29, while a bigger one is at Php45. Still trying to prepare my stomach for the main meal, I munched on the zero-oil, crispy Potato Chips. It came with several dips - creamy cheese, spicy ketchup, and garlic mayo. All three were good, but if you ask me to rank it, I'd say garlic mayo, spicy ketchup, then creamy cheese. 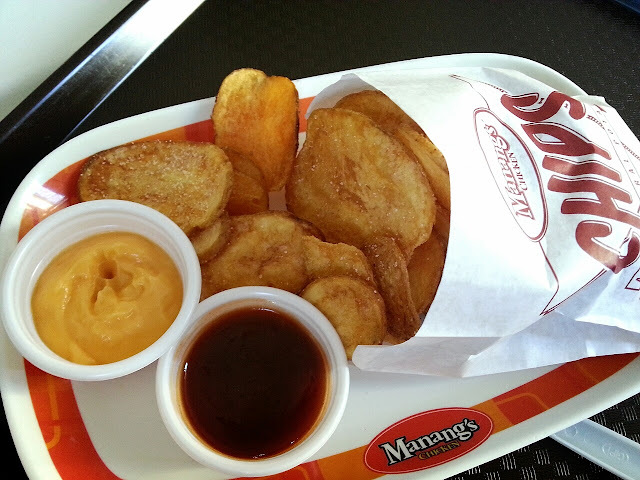 Large size of chips come with 2 dips for Php64. On to the main meal - the Garlic Pork Fillet meal. An order costs Php109, which includes rice, pork fillet, vinegar (with soy sauce), and regular drink. Starting off with what's visual, the pork fillet is huge. It's fillet, so the cut is thinner than the usual pork chop. Covering the meat is a light breading fried to a right kind of crisp. As the picture shows, it's topped with tons of toasted garlic bits, which I took in like crushed chips. The garlic has mild taste and pairs well with the meat, especially when dipped in the sauce (which I absolutely love!). With its price, I couldn't ask for anything else. The Garlic Pork Fillet meal is affordable and really filling. It's a good alternative to fast food meals, which cost almost the same if not more than this. I wouldn't say it's top-notch quality and taste, but definitely something good and worth eating once in a while. I wanted to end my meal with a red velvet ice cream, but it was out of stock. Sad as it is, overall, I had a great meal already. And my stomach cried 'stop in the name of love' coz I'm very full.